Spring Clean Your Pores with Bioré! Spring is coming, which means the time for spring cleaning is on it's way. Although spring cleaning your home is something you probably do every year, have you ever considered spring the time to really clean your face? Maybe you should be focusing on deep cleaning your skin as well! Pores get clogged, and sometimes we just don't know what to do about it, I suggest checking out Bioré. The Bioré Baking Soda Cleansing Scrub and Bioré Baking Soda Pore Cleanser can be your spring cleaning BFF's! These Bioré cleansers are pH balanced to help you reach your goal of smoother, clearer skin! The New Bioré Baking Soda Cleansing Scrub gently exfoliates the dry, flaky patches away, while penetrating your pores to dissolve dirt and oil. This is super simple to use! First, you want to wet your face and prepare yourself to have clean pores! Then, press the button on the front of the bottle to pop open the top, and pour a quarter size amount into your palm. It's activated with H2O, so add water, then apply to face. How much fun is that fizz? Massage over your face and then rinse. You'll feel it fizzing on your face, which is pretty awesome because you can feel it working! The New Bioré Baking Soda Pore Cleanser purifies your pores in two days. It's a daily cleanser and by the way, it smells pretty good. This has been added to my current night routine. Every night before bed, I sadly remove my makeup, haha. It's funny how much of a relief it is and how sad at the same time, You spend all that time putting it on & getting it how you want, only to have to take it back off. Next, I use my Bioré Baking Soda Cleansing Scrub or Bioré Baking Soda Pore Cleanser to really get my face clean and my pores clean, as well. Lastly, I'll moisturize and apply my under eye cream. Such a simple routine, but I'm currently loving it! Something about the fizziness of the Bioré Baking Soda Cleansing Scrub is relaxing! I'm always looking for a great product to clean my pores because they are a huge problem area for me. They always seem to be enlarged and clogged and the Bioré Baking Soda Cleansing Scrub and Pore Cleanser are targeted for my problem area, so I was super excited to try them. These are perfect for combination skin types. For you oily girls, I recommend the Bioré Charcoal products as they're targeted more for your skin type. 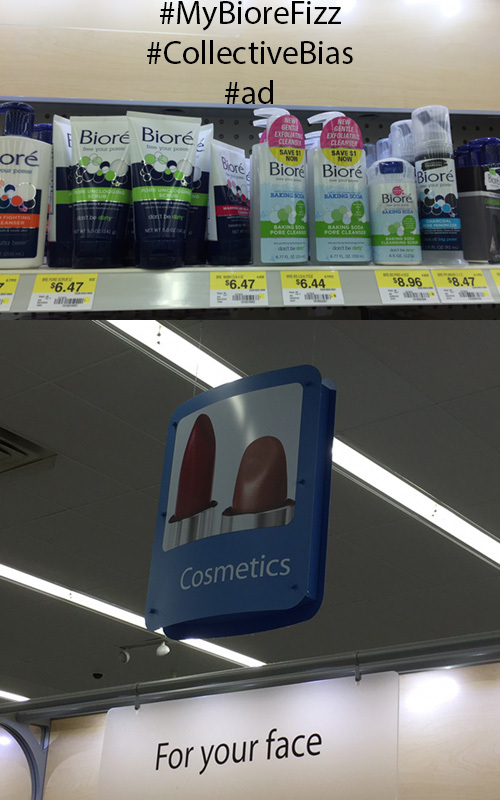 I purchased these at Walmart in the Cosmetics section, in the aisle with the skin care. Do you plan to spring clean your face with the Bioré Baking Soda Cleansing Scrub and the Bioré Baking Soda Pore Cleanser?